The main purpose of this application is aiding to search analogues for technical systems. 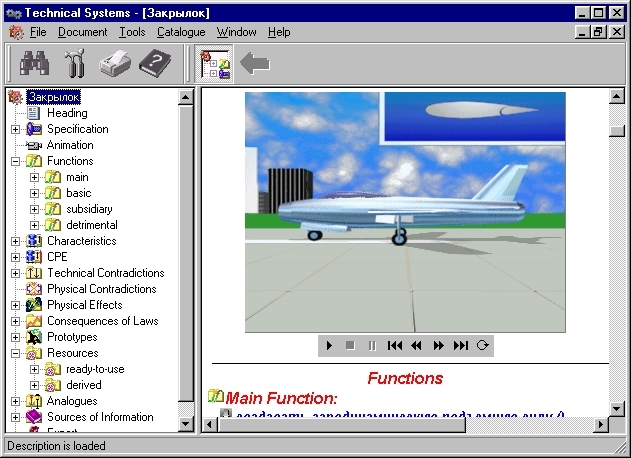 Technical systems are described using the unique method developed in UNICOR, which provides some interesting possibilities for search, including the thesaurus of functions. This is the application the first version of RichView was designed for. First we tried to use RichEdit, but after some experiments we've concluded what it's impossible to create professional looking application in this way. RichView is used for displaying a hypertext document describing one technical system (one document is assembled from about 30 database tables defining text, pictures, animation, tables (grids), links).